RNW: With all of the bands that there are to be put in front of somebody who could do something for you, put in front of the A&R guys, its sometimes luck of the draw. I mean, you all have to be talented to get where you are, but just to be able to get into that group of people that get shown to somebody who can make a difference is fabulous. TC: It was a great stroke of luck I guess. RNW: But then the talent has to take you from there and it seems like you guys have been able to do that, so that’s an accomplishment on your side. You’ve done an awful lot of touring on the first album. TC: Yes, awful being the operative word. RNW: Do you not like touring? TC: Um, no, don’t get me wrong. I do love touring, its just when you get to the 20th and the 22nd month of it, you know? It starts wearing on ya. RNW: Its definitely a different life style and you do find yourself needing a vacation from that. TC: Oh yeah, absolutely. By the end of it, we were all ready to just kill ourselves, die and go home. RNW: You just want to sit in your own living room and watch TV. TC: I’m telling ya, the day I got home was Sunday, and I sat around in my living room in my underwear, watching football all day. It was great! (laughs) I hadn’t been able to do that in almost two years. RNW: Isn’t that the perfect day? TC: Yeah, it was great! RNW: I wouldn’t mind doing that . . .
You’ve toured with an awful lot of bands too. You’ve really gotten a good cross section of bands in your genre and around your genre. Do you have a favorite band that you’ve toured with, or a favorite road story? TC: I think the most fun we’ve had was probably, if I had to single out one band, I guess it would be Fear Factory. Cause we did several tours with those guys and they were the first band to take us out. And they really taught us a lot about how to tour. RNW: About production and what have you? TC: Yeah, and just how to carry yourselves out there, as a band and as professionals. They really taught us a lot and we had a lot of fun with those guys too. I’ve known Dino for a long time. I’ve known Dino back home in the old death metal days when we used to play in the back yards in south-central (Los Angeles) and Watts. RNW: Wow, that’s a scene, huh? TC: It was definitely a scene, yeah. RNW: Now you also did two stints with Ozzfest, right? RNW: That’s the ultimate gig for hanging out with your brothers and playing music. TC: Oh yeah, its like summer camp. RNW: I know. Everyone I talk to, from Pantera and others on the main stage, on down to the first act on the third stage are like, we’re just so glad to be here and playing with our brothers. We’re having a ball grilling out and hanging out and playing and traveling and seeing the fans. It’s a really good experience. I understand though, that out of that came a to-do with video rights to a performance. What was the story there, and what was it like to deal with Sharon Osbourne? She carries a pretty big stick as far as Ozzfest is concerned. TC: Are you referring to the home video? TC: Yeah, I really don’t know what’s going on with that. All I know is that its got something to do with the legal rights and we’re not getting clearance on them for some reason or another. And, not much we can do about it really. So its just sitting there. RNW: Up to the courts now? TC: No, I don’t think we’re going to go that far, you know? I think at this point, we’re just considering it a loss. There’s nothing we can really do about it. And the sad thing is, we were just caught in the cross fire between her and another party, but I won’t go into details. RNW: No, that’s cool. You don’t have to go into it any further. I understand. You’ve changed guitarists since your first album. Now you have a new guitarist and a new CD coming out called “Machine.” How does “Machine” compare to “Wisconsin Death Trip” and what will the fans find most interesting about it? TC: Well, you know how I refer to the music as “evil disco?” This time around, its more evil and less disco. RNW: Okay, so a heavier sound? TC: Yeah, this record came out a lot darker, a lot more aggressive. RNW: Is there a reason for that? Kind of a change in your thinking and song writing styles? TC: Yeah, I think touring for 22 months had a lot to do with it. We were all pretty strung out and angry about touring. And then, you know, plus touring with Pantera. That influence did a bit too. RNW: Tell me a little bit about the first single, “This Is Not.” Did you do a video for that? TC: Yeah, we did. We shot a live video for that in LA, right before we went out on tour. We did a couple of warm up shows at a couple of clubs that we used to play all the time. Back when we were a local band. So, we shot a video for it, and it’s a high energy live video. Its really cool. We just got the final cut for it a couple of days ago. TC: Its one of those touring things, you know, where you are sitting on the bus for 14 hours, middle of the night, and one of those long drives. You’re like, I want to go home. RNW: So you all aren’t doing the video games and all of those things that keep you busy for those 14 hour drives? TC: Well, for me, some games I can’t play while the bus is moving cause I’ll get motion sick. RNW: Oh man, been there. I can’t read in a bus. That just makes me totally sick. TC: Yeah, I can’t do that. RNW: Then you are bummin man. TC: Yeah, sit back and watch a movie man. That’s about all I can do really, watch TV. RNW: You need to get books on tape or something, cause there is nothing worse than that motion sickness! For those who haven’t seen you live, what can they expect from a Static – X show? What’s the experience? TC: You can expect lots of energy, heavy guitars, disco beats and screaming and what-not. And above all, they will have a good time. TC: I’ll go over there and beat them over the head (laughs). RNW: I’m sure that some of the fans would like that! TC: Yeah, I’ve met a few. RNW: Lot of crowd surfing and things like that? RNW: Tell me what’s going on with your current tour. I see you’ll be headed for Europe and parts unknown. Do you look forward to any place in particular? TC: There’s a few places we haven’t been to before like Belgium and Sweden that I’m looking forward to. And Amsterdam is always fun (laughs). RNW: Oh yeah, I understand Amsterdam is a fun town . . . And you will be coming back here in June right? TC: Yeah, the Pantera tour starts June 20th, I believe, and will make its way through until about the end of July I think. I’m really looking forward to that tour. It’ll be great to get to see Morbid Angel, Slayer and Pantera for a month. RNW: That’s quite a line up. TC: Its going to be great. RNW: Do you feel a lot of camaraderie with those types of tours? TC: Definitely. Particularly for me. I’m just a huge fan of all those bands. As soon as I’m done playing, I’m jumping back into the crowd and watching the show, you know? RNW: Well, that’s the best place to see it from. You’ve got to get into the mosh pit. 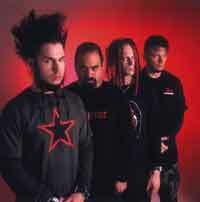 Where do you think the music of Static – X is headed in the next five or ten years? Or, for that matter, where do you think rock is headed in general? TC: I don’t know. I haven’t looked that far ahead, you know? I’m living in the now. I think I speak for the rest of the band, I don’t think any of us expected to get as far as we’ve gotten, so to be where we are now, we’re just like, wow. And we’re seeing where it takes us.